They look pretty badass for a group of little kids. Clockwise from bottom; Alex Power/Zero-G, Julie Power/Lightspeed, Jack Power/Mass Master, and Katie Power/Energizer. Power Pack was a 1980s comic book series by Marvel Comics that starred four child superheroes. While this concept is not unusual in Western Animation, it was new for the Marvel Universe. Unlike those of TV cartoon super-kids, most of the Pack's adventures were straight superhero action, with deeper real-world themes as well, such as child abuse, guns in school, bullying, and genocide - the kids were unwilling witnesses to the mass-murder of the sewer-dwelling Morlocks. The mood was lighter than other Marvel fare, but darker than typical super-kid stories. The series was about the four children of one Prof. James Power, a scientist who had invented an antimatter generator. However, a horse-like alien named Whitemane tried to warn him that a similar machine had blown up his homeworld. Unfortunately, "Whitey" (as the kids named him) was mortally wounded by his enemies, the alien Snarks, and couldn't prevent them from kidnapping the children's parents. Dying, Whitey had no choice but to pass on his superpowers to the Power children and hope that they could save the Earth and rescue their parents. With help from Whitey's living spaceship, Friday, they succeeded, and without their parents finding out about their new powers, to boot! The four of them then decided to keep their powers a secret, and continued to adventure around New York City as the "Power Pack". Alex — age 12 original version, age 14 all-ages version — with the power of Gravity, controlling an object/person's gravity by touch; he called himself Zero-G.
Julie — age 10 original version, age 12 all-ages version — power of lightspeed or "velocity". She could fly at great speed (leaving a colored trail behind) called herself Lightspeed. Jack — age 8 original version, age 10 all-ages version — power of Density. He could increase his body's density (thus shrinking down) or decrease it (becoming a living cloud) named himself Mass Master. Katie — age 5 original version, age 8 all-ages version — power of Energy. She could turn matter into energy, absorb this, and fire it at opponents, called herself Energizer. They would later find out that they could switch their powers around—or even give them all to a single person—as well. While never a major Marvel series, Power Pack lasted a surprisingly long time and had a loyal following. The series lasted for 62 issues (August, 1984-February, 1991). At one point, Franklin Richards (son of Mr. Fantastic and The Invisible Woman of the Fantastic Four) joined them for a while under the name Tattletale (his godlike powers were at the time reduced to just telepathy, precognitive dreaming, and a ghost body). The Pack met various other heroes, including Spider-Man and Wolverine. Strangely, for a long while few people called them on being superheroes at such a young age (Katie was only five years old!) or going around without adult supervision (unless you count Friday's) much less doing dangerous stuff behind their parents' backs. Their parents do eventually find out, however, and the family has to deal with it - by going insane and turning into catatonic wrecks. Fortunately for the kids, the New Mutants helped them out by having Gosamyr convince the parents it was all a misunderstanding and their kids were still normal. It's later revealed that the race of space-horses (no, really) who gave the kids their powers created mental blocks to stop their parents ever realizing that the children were superheroes, even if they showed up with a teenage alien runaway and a talking spaceship in tow or something. Which they did. Although canceled years ago, the Pack characters have resurfaced in other comics such as New Warriors and Runaways (as teenagers). In 2000 the team appeared in a new, four-issue miniseries, again as teenagers. There was an attempt in 2005 to reintroduce the team to regular Marvel continuity in an unashamedly all-ages series of books, but this was later sideways-retconned into an out-of-continuity series, as the writer of Marvel's Runaways comic introduced a version of one of the Pack characters in that book which didn't match up with the all-ages character (namely, Julie as a teenager) - or even the character from their previous appearances in the 2000 miniseries. Now, it appears as a regular series of mini-series in Marvel's Marvel Adventures imprint and it seems to have found its niche with fun stories complemented with adorable manga-esque art. Alex Power is also a member of Reed Richards's Future Foundation (as seen in the FF book) and is a regular feature of that book's supporting cast. There was a failed Pilot for a television series version, but it was never aired in the US, though it did appear on overseas channels and has circulated as a bootleg among fans for years. As of now, Marvel's new owner, Walt Disney Pictures, is wondering if this kid team would be an obvious property to develop for a film. Considering they made Big Hero 6, another obscure Marvel superhero team, into a film, there's a chance it could happen. Making a return in the pages of FF in February 2012 (the issue's title is even "The One Where Power Pack Shows Up"), the first time the whole team's been together in the mainline Marvel Universe in more than a decade (real-world time, at least). 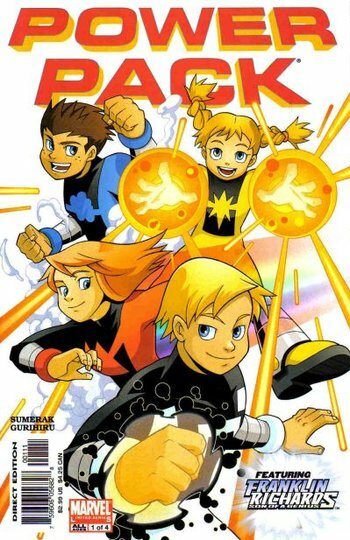 Power Pack would not receive their own comic until November 1, 2017, as a part of Marvel Legacy. Time will tell if this one-shot becomes an ongoing series. Not to be confused with a type of battery, or with the Matrix in the very poor dub of Transformers Headmasters. 10-Minute Retirement: Julie in the All-Ages version, since she was fed up with the way Alex led the team and wanted to spend more time with her friends. It lasted just 1 issue. All Girls Like Ponies: Katie in the all-ages series. Ambiguous Gender: Sort of; Friday doesn't actually have a gender, but the kids use "him" or "her" according to their own gender. And Now For Something Completely Different: Issue 47 of the original comic is entirely about Katie entering a cartoon bizarro universe straight out of Little Nemo, and trying to escape. Continuity doesn't really reference it much afterwards, yet it's the only issue to explain the costume changes. Arbitrary Skepticism: All over the first few issues. News of a UFO is readily dismissed despite several alien invasions by that point. Also, perhaps most egregious, is the fact that at one point Jack dismisses the idea that his new-found ability to understand the Snarks' language must mean Friday built translators into their costumes as "too much like science fiction"—while he's a cloud-boy floating next to an alien spaceship. Art Shift: Compare how the pack was drawn in the original series, back in the 1980's, to how they are drawn in more recent appearances (especially the all-ages series). Author Avatar: The Power kids' parents are really obviously a young Walter and Louise Simonson, and Julie is named after Louise Simonson's daughter. Badass Adorable: All of the kids in the out-of-continuity stories, but Katie Power is this in pretty much any appearance. Badass Normal: In contrast to his mainline-Marvel counterpart, in the all-ages series, Franklin Richards has no superpowers (save perhaps for an intellect on par with his dad's and a whole lot of gadgets). Bare Your Midriff: Julie since her appearance in Runaways. Baseball Episode: Nearly an entire issue of the original series takes place at or near Shea Stadium, and a baseball game (the "Mecs" vs. the "Clubs") figures into the plot. Blonde, Brunette, Redhead: Alex/Katie, Jack and Julie. Blood Knight: An ongoing thread in the original series is that of the entire family, Jack is the one with the least scruples about violence and who most enjoys their fights. Whenever the kids' powers switch in the original run, Jack immediately finds a new combat application for his new power set, such as the "gravity punch" he used as Counterweight. Late in the series, in the second power switch arc, when Maraud realizes Jack is about to receive the "Energizer" power set, she becomes stone-cold terrified of what Jack will do. Bodyguarding a Badass: The Power Pack sometimes act as an unofficial bodyguard squad for Franklin Richards, one of the most powerful characters in the Marvel universe. Since while Franklin is very powerful, he can't control his abilities and likely will never get full control of them, this is justified. Body Horror: This happens to Carmody, who is transformed into a demon. This also apparently happens to Alex, though it turns out to have been a copy. Brought Down to Badass: Both times they lost their powers to the Snarks (see below), it didn't stop the kids from standing up to the giant space lizards. Brought Down to Normal: Happens at least twice to the entire team during the original series, but each time they get their powers back again. In the all-ages series, Katie can temporarily do this to Hulk and She-Hulk by absorbing the gamma energy from their bodies. Cheerful Child: All the kids in the Marvel Adventures series are cute, but Katie is the epitome of cute as a button. Christmas Episode: The holiday special, naturally. Issue #20 of the original series is also set at Christmas time. Cool Old Lady: In an alternate future seen in "The New Mutants #49", Katie, the last remaining member of Power Pack, continues to be an active superhero that can hold her own in battles, despite being an old woman now. It helps that in this future she has all four powers at her disposal. Create Your Own Villain: The Pack's Arch-Enemy, Douglas Carmody aka "The Bogeyman", is already something of a villain when we first see him (planning to weaponize Dr. Power's converter technology rather than using it to provide cheap power and calling Dr. Power a "hippie" for wanting to do any less), but he descends into full-blown super-villainy after the converter is destroyed, descending into madness, losing the remnants of his fortune, his marriage, and basically his whole life... which he blames the Powers for. Cute Bruiser: Katie. The only reason she isn't one of the scariest people in the Marvel Universe is that she's a little kid. Darker and Edgier: Even though Power Pack always took itself seriously and wasn't afraid to portray its young heroes realistically and even put them in violent danger, apparently this wasn't enough for some people. At one point, the comic took an angsty turn and started shoving Body Horror and Nightmare Fuel all over the place, which was ultimately retconned out of existence by the original creators in a "holiday special", which returned the stories to the "not too dark, not too light" mood it originally had. Defector from Decadence: Kofi, after seeing how Power Pack is treated during their visit to Kymmellia II and realizing they are right about Kymmmellian society (see What the Hell, Hero? below), decides to leave his race and return to Earth with Power Pack. He returns after his species relocates to a new planet and renounces their old ways. James and Margaret Power are based visually on Walt and Louise Simonson. The Power kids themselves bear an uncanny similarity to the Pevensie siblings. Franchise Zombie: an in-universe example. In issue #21 of the original series, Jack and Katie get to meet their favorite author, upon which Jack asks her why she stopped writing the "Cody Davis: Space Explorer" series (which he is a fan of) in favor of writing the more childish series "Goo-Gam" (which Katie is a huge fan of). She explains that she is basically forced to do so by both her fans and editor, since Goo-Gam became far more popular with the fans than her other works, and brought in more money. By now the series takes up so much of her time that she cannot write anything else. Funny Background Event: In the all-ages books, Katie and Jack are usually doing something silly while their older siblings are working. In Thor and the Warriors Four, for instance, Jack and Lockjaw teleport away to get drinks from Hawaii, and then Katie rubs Lockjaw's belly until he falls asleep. Gender-Equal Ensemble: The core team, which consists of two boys and two girls. Averted if you count Sixth Ranger Franklin in as well, in which case it becomes a Two Girls to a Team. Girls Have Cooties: In the original series, Jack has this attitude. In issue 44 for example, Gosamyr flirts with him, which freaks him out. In the all-ages series, Katie has this attitude towards boys. God Save Us from the Queen! : Queen-Mother Maraud of the Snarks. I Hate Past Me: The future Jack Power seen in Avengers & Power Pack Assemble #4 despises his immature past self, wondering how his siblings ever managed to stand him back then. Holding Back the Phlebotinum: Especially in the early parts of the original series, Katie had a tendency to get knocked out, sedated or otherwise put to sleep so that her Energizer powers wouldn't beat the bad guys in ten seconds flat. How Do I Shot Web? : The kids don't automatically know how to use the powers given to them (neither in the original series nor the all ages series) and have to experiment to get the hang of them. The trope comes into play again after each power switch they go through, with the occasional by-product of the new owner figuring out new ways to use the power in the process. Improbable Age: While the characters are definitely childlike and think and act like actual children most of the time (a rarity in Kid Hero stories), they sometimes do things that are, at least, several years older than their age. Such as 5-year-old Katie's belief at one time that because she seriously hurt someone else, she didn't deserve to live (or something almost as dramatic). A variation—though not done in space, Alex manages to push himself around while degravitized using just about anything he can find with a spray nozzle, though he gets the most mileage out of a fire extinguisher. Later, inspired by lessons in his science class, he begins to experiment with momentary increases and reductions in his personal gravity, using inertia to direct and alter his movements. Also not in space, but Jack took the gravity power in another direction—rather than simulated flight, he managed to simulate near-Olympic-level acrobatics by reducing the effects of gravity on himself while in motion. Kid Hero: The whole premise, played mostly realistically. Klingons Love Shakespeare: Whitey's fondness for Lewis Carroll, and Kofi's love of Earth food. Learnt English from Watching Television: The all-ages version has Whitemane learning English this way. It helps that he gets to be something of a movie buff. The original has him learn it from reading human literature. Lighter and Softer: The out-of-normal-continuity stories are unashamedly "all-ages." They're not bad, actually. Lonely Together: In the original series, in issue #19, the kids' mother is badly injured (due to an incident that happened in a Thor comic), and their father spends Thanksgiving with her at the hospital. Figuring being lonely together is better than being lonely separately, Katie contacts a number of people the kids have met up to that point (Kitty Pryde and Wolverine, Cloak and Dagger, Leech and Annalee of the Morlocks, even Spider-Man) and invites them to Thanksgiving dinner. Though Spidey never shows up (and apologizes for it in issue #21), everyone else does. Magic Pants: The teams costumes are made of "unstable molecules" (or "pseudoplasm" in the all-ages comics), which allows for whoever has the density power at the moment to not have to worry about damaging or losing their clothes because of it. Their regular clothes naturally avert the trope (in the first issue, Jack actually ends up naked when he turns into a cloud). In the All-Ages version however, their normal clothes somehow also follow this trope. In the crossover with the Fantastic Four, Jack shrinks down in size to take out two bullies while he is not in his costume, but his clothes still shrink with him. Katie is this to, of all people, Wolverine. This is par for the course for Wolverine, though. Most Writers Are Adults: Handled far better than in most series involving Kid Heroes. The characters actually act like kids and show childlike reactions to the things that happen around them and to them much of the time, but not all of the time. Personality-wise, they act childlike enough to be believable, while still being competent heroes. Dialog-wise, they're... a little smart for their age, though they still say childlike things. Of course, they are the kids of a genius. Never My Fault: Carmody refuses to accept any responsibility for the converter not being ready and nearly blowing up the planet, instead blaming the Pack and carrying out a vendetta against them that is implied to have destroyed his career and even his marriage. Never Wake Up a Sleepwalker: Invoked. The children bring Franklin back to Avengers Mansion after witnessing the Morlock Massacre. When the adults find out about this, Franklin claims he was sleepwalking, and the other children say that they didn't wake him because it would be dangerous. Not Allowed to Grow Up: for a comic book series, surprisingly averted in the mainstream Earth-616 continuity of the Marvel Comics. The characters all made their debut as preteens, but over the years since their own series was cancelled and they were reduced to guest roles in other comics, all four have significantly aged up to teenagers (and in Alex case even close to young adult). So far played straight in the all-ages miniseries, though that can easily be justified by stating that in-universe those stories are set in a period of a few months at most. No Celebrities Were Harmed: The original run introduced the character of Numinus, reputed to be more powerful than Galactus and looking remarkably like Whoopi Goldberg. While her first appearance was a bit of a head-scratcher, she later showed up to help the Kymellians reform, moving out of their "flying shopping mall" and onto a new planet that "just happened" to become habitable. This significantly lowered the jerkass-quotient of the race. Oh, Crap! : After one of the team power shuffles, Snark Queen Mother Maraud has a moment of this when Jack acquires the energy power, and she realizes that he's just mature enough not to accidentally lose control of it (as Katie sometimes did), but still enough of a kid that he's not going to overthink the ramifications of the power (as Alex often did)—in essence, he's fully capable of just disintegrating and/or blowing stuff up until nothing's left standing, without putting his siblings and allies at risk from Power Incontinence. One Person, One Power: Played straight for the whole main series, with the kids getting one power each. However, it turns out that someone could easily hold all four at once, just like Whitemane did. Parental Obliviousness: At one point late in the story, enforced by mental blocks. In the 2000 miniseries the block has been removed however and both parents are now fully aware of their kids' superhero antics. Parents in Distress: In the very first story arc, and several times afterwards. Pajama-Clad Hero: During their Origin Story (both in the regular series and in the "Power Pack: Day One" story of the all-ages series), the four kids are dressed in their pajamas when not wearing their costumes since the Snarks kidnapped their parents in the middle of the night. In all incarnations of the team they received their powers from an alien that passed them on to the kids. In the original series, the kids could swap their powers around or give them all to the same person. The Snarks at one point also take all the kids powers and give them to one of their own. Downplayed however by the fact that the kids dont automatically know how to handle the powers given to them, and have to relearn after each swap. And the all-ages series features an example of a universal depowerer: The Hands superpowers suppressing magic equally effects Power Pack and Wolverine, despite the former being normal humans given powers by an alien and the latter being a mutant whose powers come from a genetic mutation. Precocious Crush: Jack has one on Kitty Pride in the all-ages cross-over with X-Men. She doesn't return the feelings and Jack finds out she is already in a relationship with Colossus. Puberty Superpower: Averted; the oldest of them was twelve though the arc where Alex apparently turned into a Kymellian invoked this trope. Puppy Love: For a while, the comic seemed to be setting up a relationship between Franklin and Katie despite them both being no older than five. Reptiles Are Abhorrent: The Snarks are reptilian. The Runaway: Both Jack and Franklin Richards in the all-age version, the former for being fed up with his siblings, the latter since he was tired of always being considered 'the child of Mr. Fantastic and Invisible woman' instead of people seeing him as a person in his own right. Sapient Ship: The group had a sentient "smartship" called Friday. Sapient Cetaceans: In a particularly Anvilicious Green Aesop story, the Powers run into a whole pod of these. In the Avengers crossover mini-series with the future story, future Katie has traded her cuteness for smoking hot. Also Julie in the pages of Avengers Academy. The Snarks are named after the Lewis Carroll poem "The Hunting of the Snark". Other Shout Outs to Carroll show up over the course of the series. Friday is named for Robinson Crusoe's servant in the original version, Rosalind Russell's character in His Girl Friday in the all-ages version. The Cleaners in issue 47 resemble Mr. Clean. Sixth Ranger: Franklin, and later Kofi. All Your Powers Combined: In the Earth-616 continuity, Alex eventually gained the ability to absorb all four powers into himself. He used this to briefly join the New Warriors before giving his powers back to his siblings. In an alternate future seen in "The New Mutants #49", Katie had all the powers of her team because her siblings had been killed off. Energy Absorption: one of the primary abilities of whoever has the energy powers. Flight: One of the 2 primary abilities of whoever possesses the velocity/lightspeed powers (most of the time Julie); she can fly with great speed. To a lesser degree, the gravity and density powers can also be used to achieve a form of Not Quite Flight (gravity by making yourself weightless in order to float, and density by turning into a cloud and thus be able to float). Only the energy powers cannot be used to achieve flight, so whoever has those powers (mostly Katie) always needs to be carried around by one of the others. Gravity Master: the primary ability of whoever possesses the gravity powers (mostly Alex). Healing Factor: In the original series, if the kids were in the same general vicinity, they could concentrate and vastly reduce the time it took for them to recover from injuries or diseases. Julie gets over a broken arm in a couple of days, and one issue has Jack and Alex suffering from a cold that they only still have because Julie is out of town. In a Single Bound: the gravity powers can be used for this. In the original series, Jack was the first one to figure this out when he received this powers, to the dismay of Alex who never though of using the powers in this way when he had them. Incredible Shrinking Man: the Density Powers allow a person to shrink to a small, yet very dense and heavy form by increasing one's density. Intangibility: the Density powers allow for this to some degree; turning into a cloud renders you intangible enough to be unharmed by physical attacks, but does not allow to pass through solid matter like walls. Pure Energy: the energy bolts that a person wielding the energy powers can unleash appear to be made of this. Sizeshifter: the "density" powers allow for this by either increasing or decreasing your density. Super Cute Super Powers: A side effect of the velocity powers is that the user leaves behind a rainbow colored streak when using them. Super Speed: one of the primary abilities of the velocity/Lightspeed powers. The upper limits of this super speed are unknown, but in the all-ages version Julie performed feats like outrunning/flying the villain Speed Demon and breaking the sound barrier. Super Toughness: The "density" powers have this as a side effect when the users increases his/her density. Teleporters and Transporters: In the mainstream Earth-616 continuity, the Velocity powers allow for this. Julie discovered this ability when she wanted to be in two places at once during the 2000 miniseries. Sixth Ranger Kofi Whitemane also possesses this power. Super Family Team: Four siblings. Temporal Paradox: Happens in the new all-ages series, specifically in Avengers & Power Pack Assemble #4. The Pack are thrown 10 years into the future by Kang the Conqueror who goes on to defeat The Avengers and other heroes and conquer the world. The Pack meanwhile encounter none other than their future selves 10 years older. Julie realizes the paradox and asks her older self how this is even possible, who simply handwaves it away by claiming it has something to do with parallel timelines. Touched by Vorlons: An alien gives the kids their special powers in the first issue. Translator Microbes: It's implied that the kids' costumes have universal translators built in. Trial Balloon Question: Seeking assurance from her mother, Julie (who has super-speed and flight at the time) is told she would still be loved "even if you grew wings and flew". Unreliable Narrator: Both Katie and Jack are guilty of this when telling Franklin Richards about their teams origin in the Power Pack: Day One miniseries, with Katie claiming Aelfyre Whitemane used a magic wand to give them their powers, and Jack bragging how he was the fearless leader that led his team to victory. The others quickly call them out on this however before telling Franklin how things really went. Very Special Episode: The Pack starred in one special anti-child-abuse comic book, as well as another with Cloak and Dagger centering on runaways. Like most siblings, the Powers bicker and argue a lot, but they really do love each other and work well as a team. Special mention should go to Katie and Franklin: Especially in the early parts of the series, whenever Franklin was around Katie would turn into a little terror and they were always fighting and calling each other names... though it soon turned more good-natured, and the comics were always hinting at a possible future romance between the two. Whitemane's entire race gets this when the Power Pack discovers what was done to their parents, in addition to discovering certain... glaring moral deficiencies in their society. Among other things, this includes Kofi's uncle essentially tricking the Power Pack—who are a bunch of primary-school children—into fighting against fully-trained adults in a gladiatorial arena without any form of defined limits or even actual consent. Not to mention they have grown so used to artificial environments as a consequence of destroying their world that natural environments are actually repellent to most of them. Whitemane, it seems, was not a typical example of his race. Fortunately, they get better. Wolverine Publicity: Both exemplified and inverted. Wolverine was a regular guest, even notoriously showing up on a cover of Uncanny X-Men looking as if he were about to skewer Katie like an olive in a martini. But everyone guest-starred in their book during its original run (though they did make appearances in Uncanny X-Men, Excalibur, Thor, and Secret Wars II), and the new miniseries are almost all team-ups. Would Hurt a Child: the pack's enemies hardly ever have any issues about fighting or using lethal force against a bunch of preteen kids. In the all-ages version some villains, notably Kraven The Hunter and Kang the Conqueror, try to avert this trope, claiming fighting kids is against their standards or something like that and offering the Pack a chance to bail out of this without fighting, but are quick to make an exception for Power Pack when the heroes provoke them enough. X Called; They Want Their Y Back: Taskmaster's reaction to the Power Pack's costumes in the all-ages series. More specifically, "1991 called, they want their big metal boots ba-AAAAAAAAAAACK!" When Franklin and Friday head into space to rescue the Powers, the Fantastic Four search for him. At the time, the Richards family was staying at Avengers Mansion, and with his parents often absent, Franklin had bonded with the Avengers' resident butler, Jarvis. Hoping they will find Franklin (and, at that point, knowing and loving Franklin as well as any of his family), buys as many of of Franklin's favorite foods as he can remember to welcome him home. "Oboy! My favorite!" became a catchphrase for Franklin under writer/artist Jon Bogdanove's tenure on the series, representing Franklin's willingness to try any food (and most activities) that the Power family put before him (a minor facet of Bogdanove's portrayal of Franklin as a very lonely little boy, as at the time he had almost become an incidental character in The Fantastic Four, a series where his own parents were starring characters).